Dual Function Slimline Pedal Bin. Small waste can be pushed in from the top or alternatively use the step on pedal to open the lid for large waste disposable. Fingerprint-proof, soft closing design bin with Hide-a-Bag feature in the inner liners. This slimline pedal bin, has a stylish and simple look, quality materials and a strong pedal operating construction. The Damper system creates a noise-free environment for better living whilst the built-in charcoal compartment guarantees an odourless living-space. This 40 litre pedal bin, features a slimline profile with its thin & narrow, space-saving shape combined with an elegant styling and practical features. The viva bin is compact and streamlined in design, so it can be positioned next to any desk, kitchen counter, or workbench to maximise the floor space available. This stylish bin has a narrow footprint to fit into tight spaces: line up two bins together for extra capacity, or combine with a matching recycler to create your recycling and waste solution. The upper lid has a circular “push top” lid that allows you to simply dispose smaller wastes without opening the full bin lid. 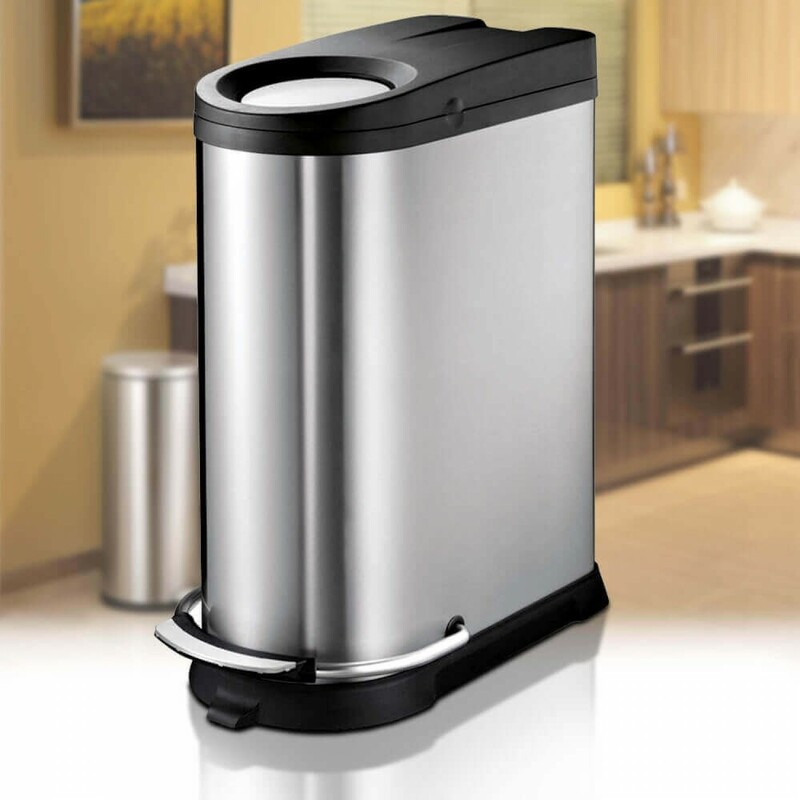 Manufactured from matt stainless steel with a fingerprint-proof coating, it features an integrated foot pedal for hands-free disposal, and a soft-closing lid with innovative damper technology to ensure it closes quickly and quietly after use. Made from smear & smudge-proof stainless Silver steel with a durable ABS plastic lid. Strongly constructed steel bar pedal with a non-slip black coating. Extra design features include a soft close system on the lid for smooth and quiet operation, a black plastic inner bucket with tuck-away big bag liner hiding system, and a non-slip black plastic base to protect floors.